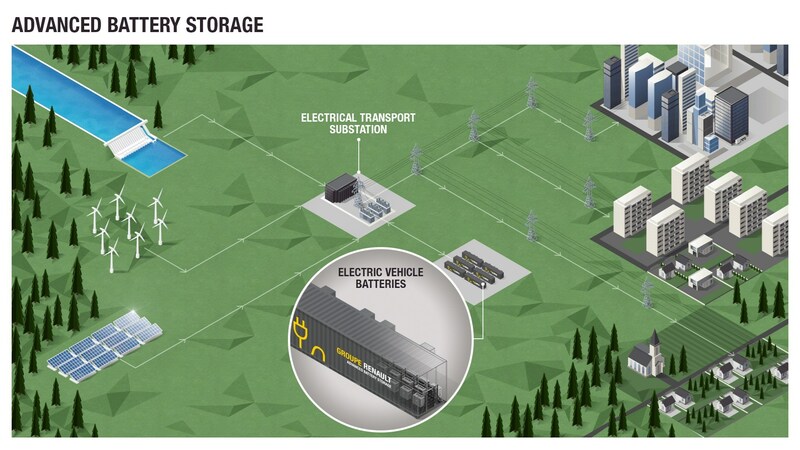 French company Renault is launching the biggest energy stationary storage system from EV batteries in Europe, and just introduced Advanced Battery Storage, a stationary storage system for energy developed exclusively from EV batteries. Will there be enough electricity to power the growing number of EVs out on roads? That’s why Renault is set out to develop new storage capacity of at least 60 MWh, making it the largest system of its kind built in Europe and the equivalent of powering a city of 50,000 households. The first facilities will be developed early next year on three sites in France and Germany, with one site being a former coal-fired plant. Automakers have been following Tesla’s lead in converting EV battery packs into energy storage units. Tesla began in 2015 by launching its Tesla Energy unit and rolling out their popular Powerwall storage product. The list of companies rolling out large energy storage projects has grown considerably with BMW, Daimler, Nissan, and Toyota following close behind, and Hyundai and Kia recently joining the pack. However, Tesla and other vehicle makers are well behind Asian electronics and automotive suppliers as market leaders. Panasonic, BYD, LG Chem, Samsung, Wanxiang, GS Yuasa, and Lishen top the chart. Panasonic is the leading global li-ion battery manufacturer, and is also a partner with Tesla in the Nevada Gigafactory battery plant. BYD is best known for its dominant EV sales, being global Number 1 seller in the past three years. The company is also taking leading role in electric bus sales around the world and electric monorails. LG Chem is focusing on storage systems meant to stabilize renewable energy and its vulnerability to fluctuating weather conditions impacting solar panels and wind turbines. LG just launched an energy storage product designed to help stabilize the solar energy grid. LG Electronics USA unveiled Energy Storage Systems and an expandable battery pack for American homeowners.